We know skin changes as you age. How you care for your skin should change as well. What worked in one decade may not address your needs in the next, and how well you take care of your skin when younger will determine what interventions will be most appropriate when you’re older. A combination of smart in-home care and in-office procedures will help you gain a smooth, even, radiant complexion that defies the aging process. With guidance from our team of leading dermatologists in Beverly Hills, we will help you maintain beautiful, natural, healthy skin for a lifetime. There are truisms in life and in skin care. These rules outlined by the board-certified dermatologists at Moy, Fincher, Chipps Facial Plastics & Dermatology are the foundation of youthful, healthy, natural skin. These rules apply to everyone regardless of age, gender or nationality. Prevention is key! Establishing a healthy skin care routine is important to prevent premature aging. Skin changes in the 20s, and finding a cleanser and moisturizer specific to your skin type will keep your complexion clear and bright. One of our board certified dermatologists can help devise an effective treatment plan that helps balance hormones with diet, stress reduction, and topical and sometime oral medicines to tackle blemishes that often plague us in our 20s. Your best dollar spent in your 20s is on SPF, and the best one is the one that you’ll wear. Choose a sunscreen that has an SPF of at least 30, and for extra protection, try one of our Sheer Defense sunscreens that contain DNA repair enzymes. UV damage is cumulative, so getting into a good regimen now will ward off wrinkles and dark spots and protect your collagen. Young adults tend to skimp on sleep, drink, smoke and tan outdoors without protection. Limiting toxins, getting enough sleep, and avoiding UV-induced tanning will not only keep your skin brighter and healthier but will also help decrease your risk of skin cancer, including melanoma, the most dangerous form of skin cancer. According to experts, we receive about 25% of our lifetime UV exposure by the age of 18 and another 10-15% in our early 20s. Don’t become a statistic and start protecting daily if you haven’t already. Learn more about skin cancer and skin cancer prevention. The 20s is also the perfect time to start thinking about prejuvenating your skin with treatments to help prevent signs of aging. Our most popular laser in this age group is the Clear + Brilliant laser. It has very little downtime and helps skin regain its radiance, while minimizing large pores and decreasing pigmentation. Micro doses of Botox and Dysport can also be used to help prevent forehead lines, crow’s feet, and angry 11s. Starting mini treatments early can help prevent lines from becoming more noticeable in the 30s and 40s. While hormonal acne is often still a problem in this decade, pigmentation, broken blood vessels and fine lines define our 30s. Pigmentation can be caused by the sun and appear as brown spots over the nose and cheeks or caused by melasma, a hormonal and often pregnancy-related patchy pigmentation on the forehead, cheeks and upper lip. While sun protection with SPF remains important, pigmentation can be lifted with lasers like our Piqo4 and Clear + Brilliant lasers and lightening creams. Because hormonal pigmentation can be stubborn and easily worsened by heat, treatments must be performed by experts, so as not to exacerbate unwanted discoloration. Broken blood vessels on the cheeks and around the nose can be treated with our PDL laser. Some conditions like rosacea can predispose to excess redness, so it’s important to see a board certified dermatologist who can help determine if additional topical creams would be helpful in reducing redness. After 30 decades of facial expressions, we start to see fine lines settle in the forehead, between the eyebrows and at the corners of the eyes in the 30s. The best treatment for these is Botox or Dysport, which helps relax muscles and smooth fine lines, preventing them from becoming etched into the skin. Over time, if treatments are continued, muscles are trained not to scowl and squint, and less product is needed. Finally, as collagen production declines and cell turnover slows, the complexion becomes more dull in the 30s as well. Because the eyelid skin is thin and delicate, textural changes are often noticed here first. Using our DNA EGF eye balm in this are as well as doing regular laser treatments with our Clear + Brilliant or Erbium lasers can help improve dullness and stimulate new collagen synthesis for healthier, smoother skin. These lasers can target unwanted pigmentation as well as remove top layers of damage, promoting healthier skin. This is the decade where thinning skin and decreasing collagen create more noticeable skin lines and folds. Bone and fat loss as well as decreased skin elasticity lead to noticeable laugh lines and the beginning of jowls. In this decade skin cell turnover slows even more causing worsening dullness and poor texture. To help lift tissues and diminish lines and folds, soft tissue fillers like Restylane and Juvederm can be used to help restore age-related volume loss. These products must be used thoughtfully to restore a youthful appearance without giving an “overfilled” or heavy look. Trusting and expert in anatomy and facial aging is important, so that you receive the most natural looking results. Botox and Dysport continue to be important to smooth dynamic fine lines in the 40s, and skin tightening becomes very important as well. As we continue to loose bone and fat tissues in our 40s, our skin suddenly becomes too large for its underlying support. Procedures that tighten the skin like Pelleve, Pollogen, Vivace and Endymed give back definition along the jaw and help reduce early signs of jowling. These treatments use radiofrequency heat with or without microneedles to stimulate collagen production and tighten the skin. Finally, laser resurfacing with our erbium laser is often popular in this decade as it helps remove damage, improve discolorations, and even skin tone and texture. Menopause changes the skin game. A decrease in estrogen and progesterone begins in the late 30’s or early 40’s leading to dry, thin skin in your 50’s. Natural oil production also decreases accentuating wrinkles and folds. Additional bone, fat, and muscle loss, lead to facial hollows and an aged appearance. Cumulative sun damage creates uneven skin tone and mottled pigmentation. Volume loss and collagen loss can again be addressed with the judicious use of soft tissue fillers like Restylane and Juvederm. These products can be used to recreate youthful contours if placed by an expert. Sometimes, if too much skin looseness is present, we recommend minimally-invasive surgical procedures like a lower face lift, neck lift, or blepharoplasty to remove excess skin and restore younger contours. But volume restoration and surgical contour improvement is often best accompanied by laser resurfacing in these decades. Smoother and tighter skin often still appears “old” if the skin itself shows fine lines and excess sun damage. Laser resurfacing treatments like a sweep with our fractionated CO2 laser can remove such damage, stimulate collagen synthesis and beautifully improve skin tone, texture and radiance. Similarly, bioidentical hormones and help thicken the skin, so that it better matches newly restored contours. Even if the trinity of genetics, time and sun damage have left their mark, a combination of rejuvenating techniques in the 50s and beyond can significantly restore a natural more youthful appearance. Although the skin problems and treatments discussed above are outlined by decade, it’s important to remember that everyone ages differently and that we always treat individual concerns. 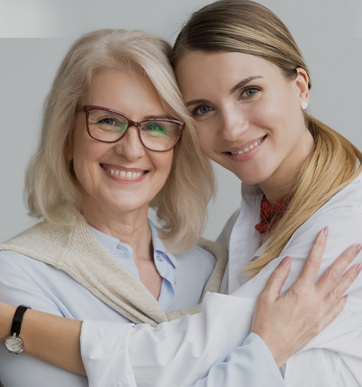 If you’re interested in discussing your aging concerns with one of our board-certified, fellowship-trained dermatologists and cosmetic surgeons, call us at 310-274-5372 to schedule a personalized consultation.